There are a lot of perks that come with membership at the New England Aquarium, like express admission all year and discounts at the Cafe and Gift Shop. Now you can add our new Member of the Week contest to that list. How can members participate? Just show up and visit your Aquarium! We'll be randomly selecting members for this special honor throughout the fall. Meet Ganesh and Medha (she's the little fish) from Boston. They visited with their friends Jessica and Zachary today and were surprised with the distinction of being our members of the week! Ganesh said they became members just last month because it's a great place to visit with the little ones. "When you have toddlers, you just want to visit for 45 minutes at a time," he said. With membership, you can come and go as often as you please! 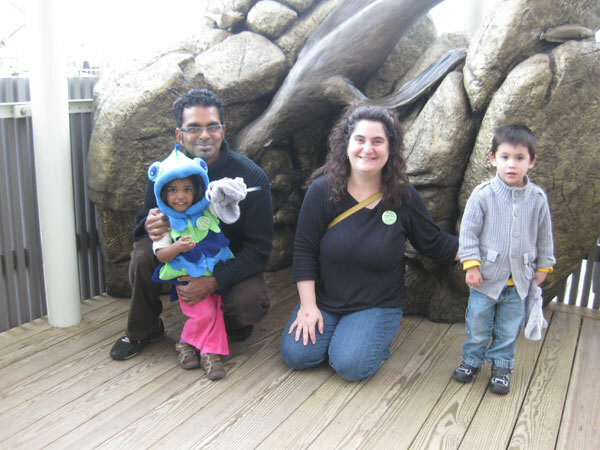 Members Medha and Ganesh (left), visiting with friends Jessica and Zachary, posed near the fur seal statues. Medha couldn't wait for Halloween to show off her fish costume. She was in excellent company here at the Aquarium. Zachary is planning to be a dragon (not of the seadragon variety), but his little sister is going to be a penguin! For being our Member of the Week, the kids took home some adorable plush rays. Visiting aquarium is a great experience one can have, love the pic has nice background especially the seal fish.